Real life Ruaidhri is very different to how I conduct myself in games. I’m not talking about the obvious hyper-violent characters or anything to that effect. I’m not even saying I become a troll when gaming online, I avoid conflict wherever possible. There is one area of my psyche that does a full 180 when playing games, I become vengeful. I’ve played a lot of Civilization V and VI over the past year and it’s common for the first person to annoy me to be the first nation I destroy, even if that’s 2000 years later. Something about getting wronged by artificial intelligence rubs me the wrong way and I often feel the urge to scream about them ‘ruing the day’. Bow to Blood: Last Captain Standing is essentially prime for my play style. AI come out the woodwork begging for help and issuing threats in this dystopian future televised flying ship competition allowing me to make snap judgements on their character and the tone. I may have a god complex, and I may be a vengeful one at that. 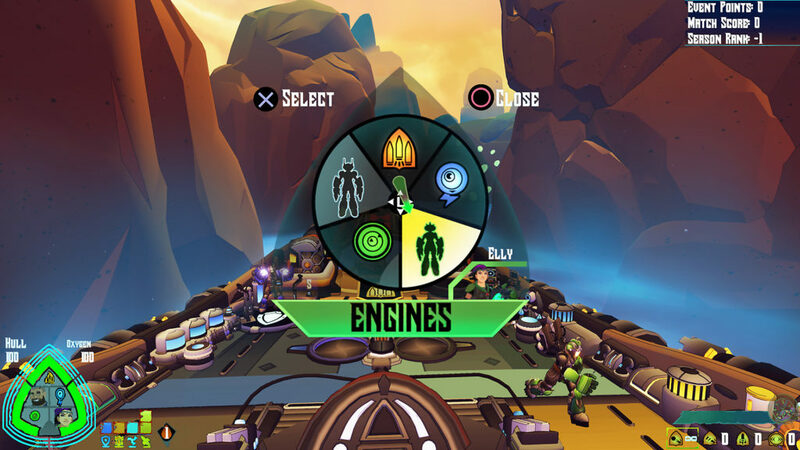 Taking the role of the Freelancer its up to you to command your ship and crew of two to victory in a competition that will test your flying abilities, your combat skills and your bravery when it comes to risk and reward. You’ll also be interacting with all of the opponents in the competition; aiding them in missions, flying below the toxic clouds you sail on to get some treasure to share or doling out your hard earned points. After every couple of missions there’s a culling where the bottom two ships, by points on the leader board, are up for eviction from the game. This is dictated by votes from the other competitors, and here’s where diplomacy comes in. Early on people will start asking for help, give them a hand and if you find yourself in the bottom two you may find that they vote to save you. Once certain opinions have been made regarding you it can be hard to win people back and often there are already pre-formed cliques meaning angering one person may jade another. Before each new mission you get to pick from two choices, each will have a different location and mission objective within, there will also be something related to one of the other competitors, be it let’s share the loot, lets share the points or simply let me win. Missions include grand battles with big bosses, racing across the sky, hunting for eggs or just cruise around a valley looking for crates with points within. Once you’ve chosen your mission type and location you must then work out the impenetrably confusing control scheme. At the start of the game you’re run through a basic tutorial that fires out information at such at rate it’s amazing users aren’t getting whiplash. The move controllers especially suffer from this issue where the attempt to have shortcut buttons for some powers and abilities instead just over complicates things. The ship controls wonderfully however and despite it’s size is really quite maneuverable. Once you’ve got the hang of the controls you’ll be whipping around corners and taking steep inclined and declines in your stride. The ship is broken into five sections. Shields, Guns, Engines, Surveying and the Smart Drone. If you’ve played the Star Trek Bridge Crew VR game and been engineer or been through FTL you’ll be familiar with the set-up, move limited energy around and prioritise what’s best in any given situation. To help with the running of the abilities you have a crew of two, this man and woman (who I thought were robots for the longest time thanks to their armour, a loading screen piece of artwork corrected me) can be assigned to any of the sections to either repair or trigger the abilities. Whilst you’re juggling energy, flying, shooting and navigation it certainly helps to have a couple of people to mess about with the sections at least to some extent. Though realistically this meant leaving one of them on turrets 24/7 and using the other to repair or use the smart drone that disables elements on enemy ships. With your move controller you can shoot the cannons on the left and right of the ship to take out enemies and if any smaller drones come too close you can pull out your gun from it’s holster and manually take them down at close range. All in all this adds up to a crazy complicated affair, that is also wonderfully satisfying. Once you’ve reached a certain objective you’ll be allowed to warp out of the location to the next mission or the voting. However this is optional, you can instead just fly around and grind enemies for points, hunt for more treasure cache’s or just enjoy the scene. When you’re ready to go you can cash in your points and see your ranking. If you stayed behind and died however then it’s gone. 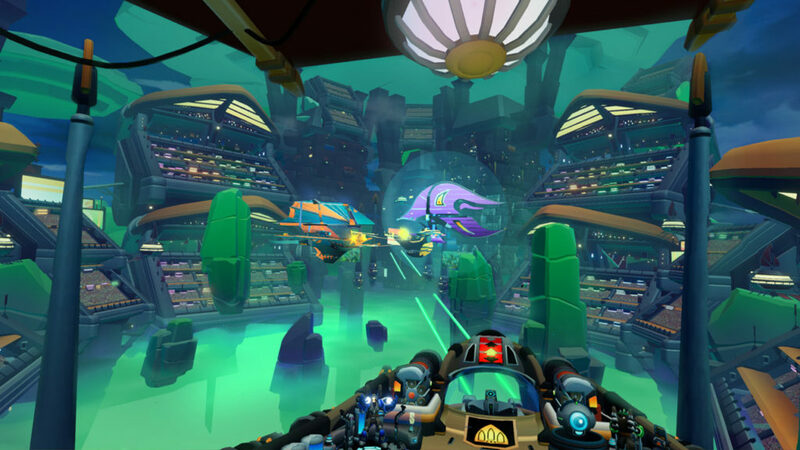 For this review I was primarily playing on a PS4 with PSVR, however as part of this latest update ‘flat versions’ are now available across all systems. The game has a wonderful stylised world with its almost 3d vector art / cell shaded models. This transfers wonderfully between the Virtual Reality and the Flat versions of the games, the frame-rate holds strong and it really is a memorable world to inhabit. Personally I would recommend going down the VR route if you have the option, something that is somewhat lost in the regular game is the scale of the ship and the world that is somewhat dampened on a television. On the flip side, if you’re going to break out your PSVR to play this be aware that the aliasing (jagged edges) is incredibly jarring when you first load up. That is not to say you can’t get used to it but it really was a shock to the system on first boot. The audio is just as stylised as the visuals. 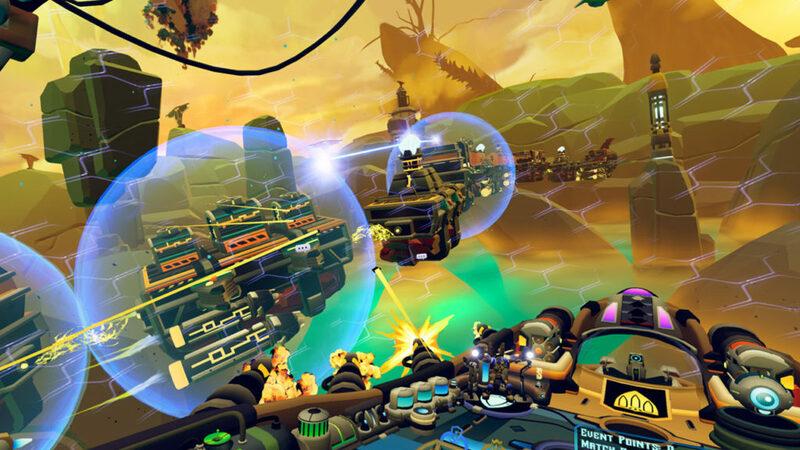 Cannons and energy shots ping and pop all over the canyons you’re in, the ambient music gives a little bit of joyful epic to any situation, the sound and visuals match in a way that a lot of games don’t, the theme and the style blends across the two perfectly. Whether playing on the flat version on any of the consoles or PC or the VR version on PS4 or PC you’re sure to get enjoyment out of this. The aesthetics and design of the world are strong and the humour of characters and interactions are a pleasant surprise to what could have been another grey / brown post-apocalyptic first person game. There isn’t much world building in terms of lore which is a shame as there are story beats hinted at with this reality show competition but it’s never built upon enough to be a key feature. The randomised missions and interactions means that each run will give you something different. With a season only taking a few hours it’s easy to get a few runs out of this and enjoy the replay-ability. 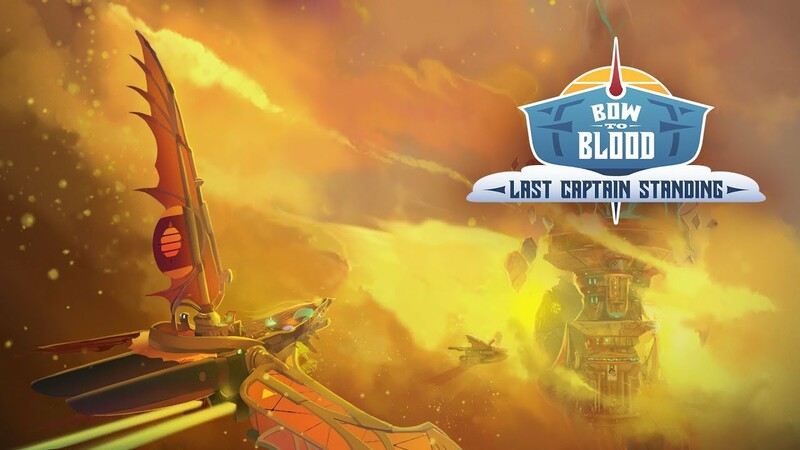 The scale and drama is best represented in VR and that will always be my go to way to play Bow to Blood: Last Captain Standing but even on a TV this has the makings of a seriously addictive game.